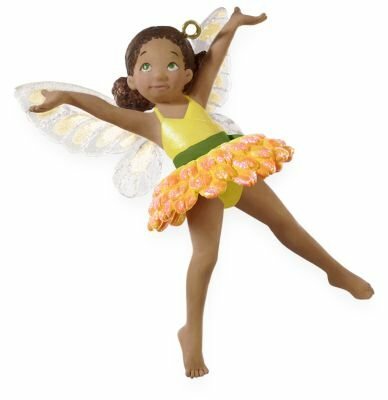 The Hallmark Fairy Messenger Ornaments are adorable, sweet, cute, shy, sassy, all the things that fairies should be. This is a great series to collect if you love fairies. 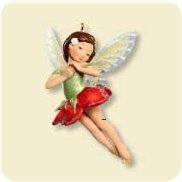 They are wonderful gifts for girls who love fairies and would be a great way to start her very own ornament collection for when she has a home of her own some day. Grandparents, this would be a great choice to start a collection for your granddaughter. 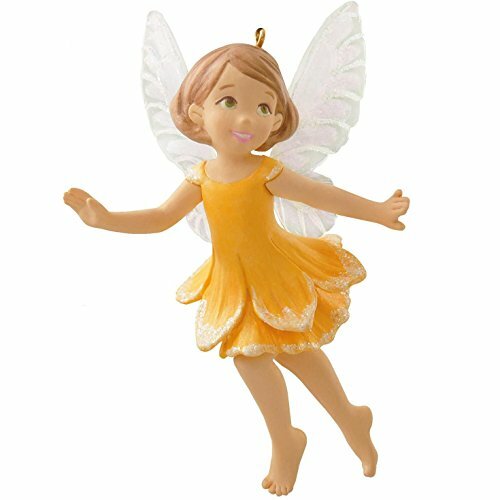 The fairies here represent sweetness and innocence and will look very cute on the tree. 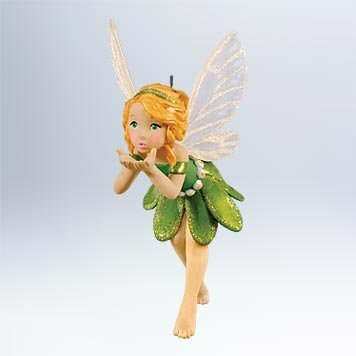 Here are the cute Hallmark Fairy Messenger Ornaments through the years. This year (2016) I couldn’t find the fairy messenger for 2010. It could be that she’ll become available at a later date. 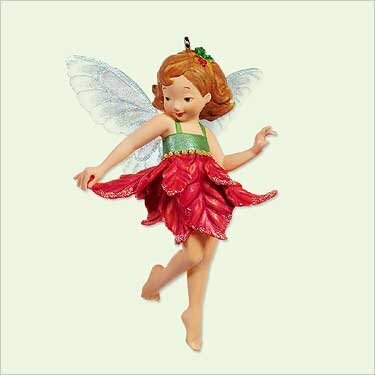 The message of the Poinsettia Fairy Messenger is “Be of Good Cheer.” She wears a red skirt composed of poinsettia blossoms and she was released in 2005. She’s a great start to the Hallmark Fairy Messenger Ornament Collection. 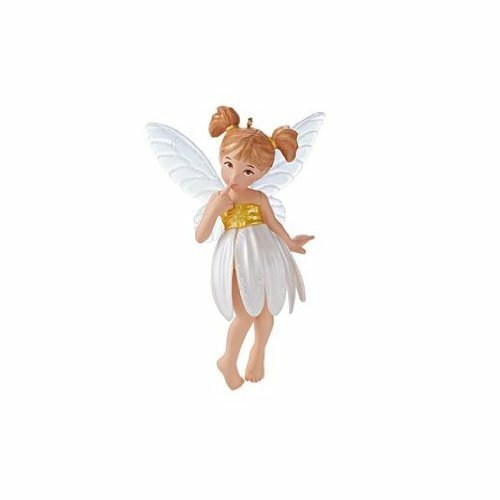 The Hallmark Pansy Fairy Messenger Ornament is second in the series and came out in 2006. She’s adorable all dressed in a purple pansy dress and wearing purple flowers in her hair. The Rose Fairy Messenger is number three in the series and is dated 2007. She wears a skirt of rose petals and is a Hallmark Keepsake Ornament. Doesn’t she look sweet? The adorable Lily Fairy Messenger wears a dress made from the bloom of a calla lily. She made her appearance in 2008 and is the fourth in the series. The Lily Fairy Messenger looks shy and playful. The Marigold Fairy Messenger made her debut in 2009 and is fifth in the series. Her skirt is a colorful marigold blossom. Perhaps she’s delivering a message of joy. 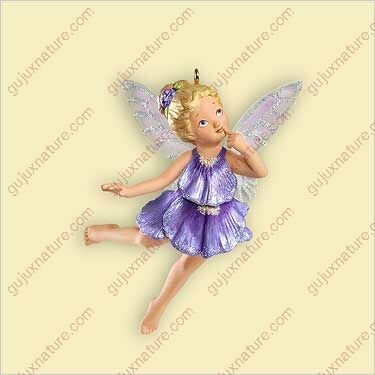 The Bluebell Fairy Messenger Hallmark Keepsake Ornament is dressed in a bluebell blossom, of course. She looks pensive, perhaps contemplating the message she’s about to deliver. The Bluebell Fairy Messenger debuted in 2010. The Mistletoe Fairy Messenger is dressed in the green mistletoe of course. She blows a kiss to represent the tradition of kissing under the mistletoe at Christmas time. She is the Fairy Messenger for 2011. 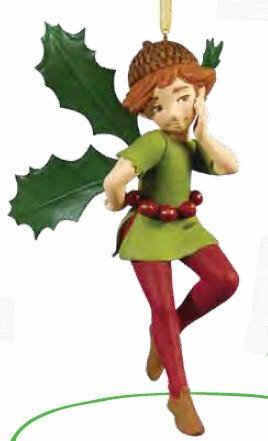 The Holly Fairy goes with the Mistletoe Fairy. She blows him a kiss and he catches it on his cheek. They are so cute together! A limited quantity ornament released in 2011. 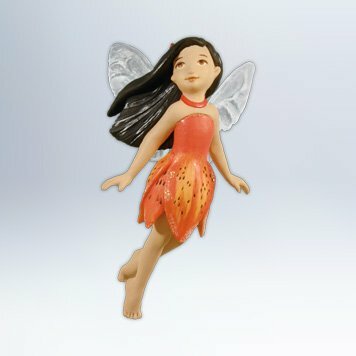 The beautiful Tiger Lily Fairy Messenger is dressed in the bright orange petals of the Tiger Lily. She looks like she has warm summer breezes blowing through her hair. She is the Fairy Messenger for 2012. The delicate Daisy, wears sweet daisy petals with her hair in pigtails. She truly looks like a little girl and is a great addition to this series. 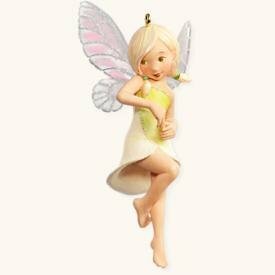 She’s the fairy for 2013 and is 9th in this cute series. 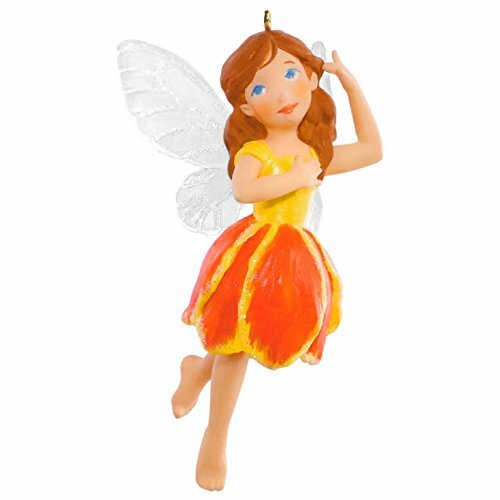 The sweet Daffodil fairy is dressed in the sunny colors of her name sake flower. A look of innocence is on her face as she frolics among the yellow flowers. She represents 2014 and is the 10th in the series. As a water-bloomer, the lotus flower enchants with colors that range from blue to white to red. 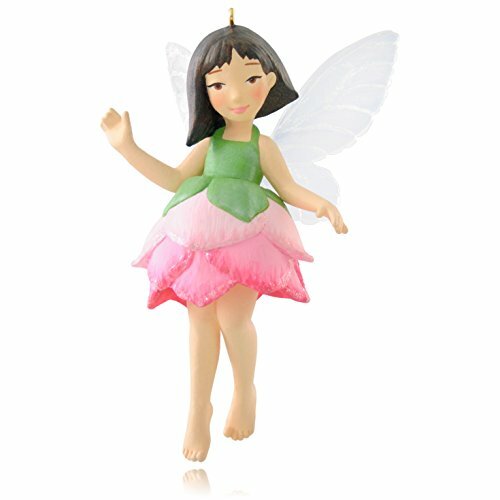 Pink petals complement the rosy pink cheeks and peaceful gaze of the Lotus Fairy, the 11th ornament in the Fairy Messengers series. Dated 2015.